Do You Create FOMO Among Your Customers’ Connections? Vacations are ripe for creating memorable customer experiences. Think about your last vacation for a moment now. Do images of interesting people and beautiful places pass through your mind? What do you remember from your precious time-off? Recently my husband and I vacationed in Paris. We returned with special memories. 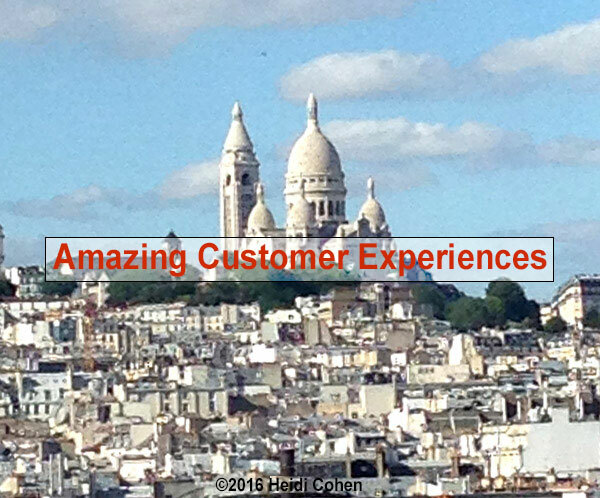 Our trip made me think about how an amazing customer experience gets rid of the need for customer service. Once you need to offer customer service, you’re on the wrong side of the customer experience. You’re doomed to play catch up. Vacations amplify your experience. You invest time and money into a vacation that will create amazing memories. As a marketer, think about where amazing vacation experiences are shared. It’s person-to-person or social media where you can’t control the message. Despite having lived in Paris and visited many times, my husband got pick pocketed within a half hour of our landing! I read about the finesse of Paris pickpockets. Being New Yorkers, we thought we wouldn’t have any problems. BUT Cecilia and Claire came to our rescue. They were calm and ready to help. While Cecilia checked us checked in, Clare offered us coffee we badly needed. Fortunately, we had paper copies of our passports, other identification and credit cards along with phone numbers to cancel my husband’s credit cards. Cecilia and Claire responded to the companies that verified our whereabouts. They also recommended we make a police report and arranged a taxi to take us to the nearest station. When we checked out at the end of our trip, I wanted to go to the airport via train to prove we could do it. But Claire wouldn’t let us. Instead she arranged for a car to take us for only 30 Euros more than the train. Before dinner, we stopped at Bar Du Bristol. It’s ranked the top one in Europe. 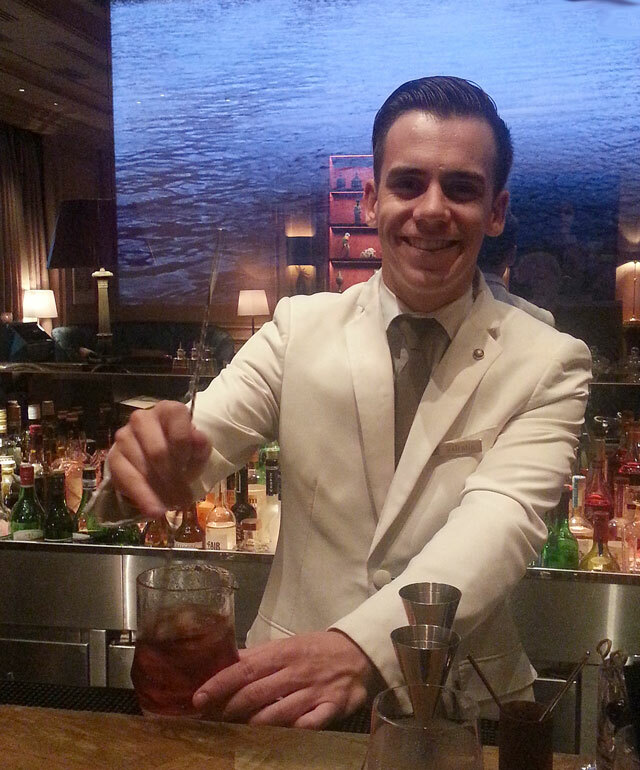 To celebrate, the master bartender created a book of their special drinks. With high quality photography and paper, it’s content marketing at it’s best. The bartenders took great pride in their work. They understood customer experience. Served in small colored glasses. Sitting at the bar, we chose their house vodka drink. Every step our bartender Val made mixing the drink was part of an elaborate performance. He embellished the drinks with edible pansies. Epicure is rated one of the best hotel restaurants in the world for good reason. Practiced in every detail of food presentation and service, the entire staff delighted in helping us have a great experience. 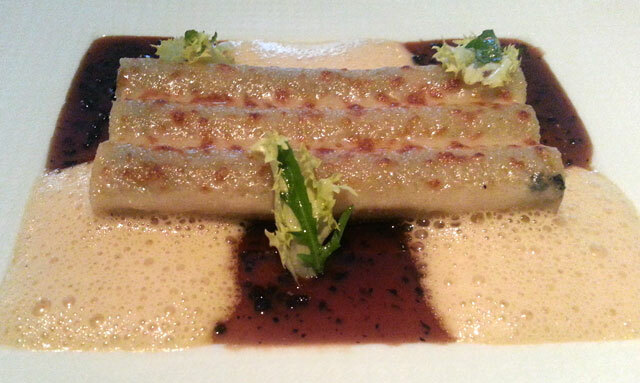 For starters I had macaroni stuffed with black truffle, artichoke and duck foie gras, gratinéed with aged Parmesan. It was so rich and good I could have stopped dinner there. When our Maître’d Thomas saw me soaking up the leftover sauce, he bought me more. He also served my husband some so he could enjoy it. By contrast my lamb main course, a new dish, was disappointing. When the general manager, Remi, heard it wasn’t as good as I had hoped, he asked the chef to make me the duck. I begged him not to cause the extra work but he insisted. Despite being one of the best meals I’ve ever had, Epicure managed to pack a surprise at the end of the meal. After the dessert, a special rolling box was brought to each table. The box had a mirror finish. The waitress handled it with white gloves positioning it so no other diners could peek in. It radiated light when opened. From it, she served a variety of hand made macaroons, caramels and chocolates. In today’s air travel market it’s tough to get an amazing customer experience unless you’re in premium class. But British Airways delivered. Due to bad weather across Europe, our flight home via London was delayed. As were other flights through Heathrow. The result: Everyone was packed into the back of what I lovingly call schlep class. My husband and I went from having a window and an isle seat to having 2 center seats with seat mates on either side of us. But our economy section’s British Airways steward was a whiz at making everyone happy and calm. (Unfortunately, I didn’t write down his name or get a photo.) BUT he was one of the best I’ve seen! To make everyone happier, he collected tickets from people who wanted to change seats. He then played human chess. He moved a few people strategically to be where they wanted to be. He offered the passengers who moved a glass of champagne pre-flight in economy. The gentleman who moved next to us was thrilled. Bottom line: Happy passengers for a long cross-Atlantic flight and an easier job for the steward. Cost to BA: A few glasses of champagne to few inconvenienced passengers served before take-off. The biggest key: Remember you’re dealing with other people. Treat them with respect. My husband and I haven’t stopped talking about his birthday lunch at The Modern. His plate literally broke in half while he was taking a forkful of food. It was a clean break. The best part was the server’s quick comic response. Understand that your customers tell others, especially if they have a problem. According to FayKeller research, most of word of mouth occurs person to person. There’s also FOMO (fear of missing out). In today’s world great experiences translate to Facebook and Instagram shares. Flying economy isn’t fun especially when you’ve got a plane full of upset travelers who’ve been delayed. Making a small change can improve the overall experience for everyone. Encourage employees to ask open-ended questions. Otherwise, you’re restricting the potential information you receive. At Epicure the general manager asked about the lamb because the chef had recently changed the menu. Remi had a feeling it wasn’t as good as the former offering. He made good without asking me. Tell your employees what they can do to make customers happy about their purchases. Encourage employees to think beyond “It’s not my fault.” Once you’re talking like this, you’re fighting an uphill battle. Granted it’s easier to do in smaller businesses. They’re more likely to want to keep each customer. Also, the owner may be present to make decisions. 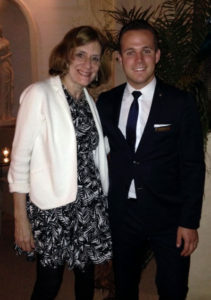 As Hotel Fabric’s concierge Cecelia told us, Claire taught them to make their guests happy. Closer to home, Trader Joe’s empowers employees to be cheery and helpful. They’ll walk around the store to find what you need. 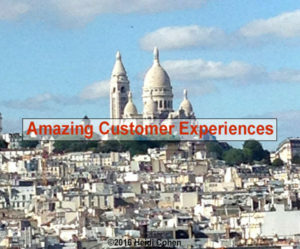 Amazing customer experiences are at the core of most businesses. Without happy customers your company can’t survive. In today’s social media connected world, your goal should be to create FOMO among your customers’ family, friends and social media connections. Work with your customer facing staff to train them to make your customer happy. Give your employees the ability to make buying from your company a positive experience. At Galleries Lafayette, for example, I tried on a Chloe coat. I walked around like I owned the coat. I had a blast. I bet the salesperson knew I didn’t plan to buy it. But she graciously took the coat off of the manikin and gave me purchase information. Many times an amazing customer experience is about how your employees make the customer feel. Just the act of being interested and caring can go a long way to making a memorable customer experience. At a minimum, you have the chance to make someone smile and improve their day. Photo Credits: (c)2016 Heidi Cohen – Use permitted if there’s a link to this article. Tags Ann Handley, British Airways, Epicure, Hotel Fabric. Bookmark the permalink. Hey thank you for your helpful article. I think in the mobile era, having a mobile native app is the fastest way to get closer to your customers. I have used IcyMobi a Magento mobile app builder for my business. It helped me to build my own ecommerce app without any programming language. Try it! Thanks for sharing these experiences. I see, the second incident had happened with me as well.